During the past week the Avro pilots at Blackpool have been kept busy, and we understand that the ten thousandth passenger was taken up, which is remarkable considering that the flying there did not start until the middle of May. There has been no accident during the period, with the exception of one machine which landed in the sea, owing to the high-tension lead dropping off; the Avro motto of "Safety First," which is painted on large notice boards all round the aerodrome,being well maintained. So confident are the public nowadays that they turn up for flights in any weather—rain, blow or hail—whereas when the show started, they would not look at a machine if there were the semblance of a wind. Several days last week regular passenger flying was carried out in winds of between,30 and 40 m.p.h. One day the wind was so strong that it lifted several machines 5 ft. from their sandbag moorings on the beach. Several five-seater machines, fitted with 160 h.p. BR.1 engines are now in commission. Southport is proving a good second to Blackpool, and among the passengers taken up was the Mayor, Alderman J. Wood, who enjoyed looping and spinning. Quite half the passengers have been ladies, and six of them have asked to be allowed to go through a course of lessons. One man arrived at Southport a few days ago about 9 p.m.—when it was blowing a gale and the clouds were low—and offered £200 for a flight to the Isle of Man, explaining that he wanted to give his wife a surprise. 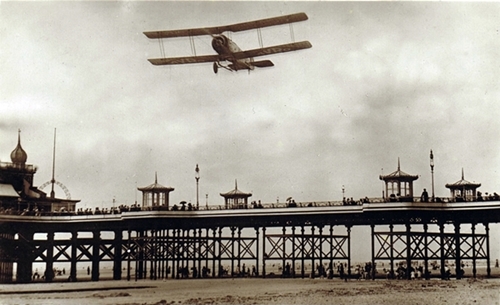 An AVRO Aircraft flying over South Pier, Blackpool, 1919. THE five-seater Avros signified their arrival at Blackpool by setting up new records last week, nearly 500 passengers being flown in one day by three pilots—some flying! The holiday crowds have now arrived, and evince the keenest interest in the performance of the aeroplanes. Thousands throng the beach all day long looking for the day when flights will be 5s. each. Last Saturday flying at Southport continued until 10 p.m., and even then there were a few more couples anxious to book a trip in the moonlight. FREE FLIGHTS FOR LOCAL RESIDENTS. A hundred and fifty flights have been booked with Messrs. A. V. Roe & Co., of South Shore, by Boots, the chemists, and these flights will be free to customers at the local branches. The flights will take place from August 19th to 23rd inclusive (weather permitting). The scheme arranged is that during the whole of the week commencing Monday next every purchaser of goods to the value of 1s. at any of the local branches of Boots, the chemists, will receive a flight application form. The customer will fill in his or her name and address, and return the form to the shop. After business hours thirty forms will be picked by ballot each day and the holders notified that they are eligible for a free flight the following day. The Mayor of Blackpool (Ald. Parkinson, M.P.) will draw the first thirty, and the subsequent selections will be made by the Deputy Mayor (Ald. Collins). Coun. T. Masheter, Dr. Carr, and Mr. J. B. Calkeld. Each day twenty flights will be allocated to the customers of the two Blackpool branches and the remaining ten to the customers of the St. Annes and Fleetwood branches. If the flight cannot be made on the day arranged another date will be selected and the ticket-holder notified. If the person selected does not desire a flight the opportunity may be passed on to a friend who desires one. The selections will be made each day at the Blackpool Winter Gardens, and announced from the stage of the Empress Ballroom. The flights will take place from the. Avro Aerodrome at South Shore. 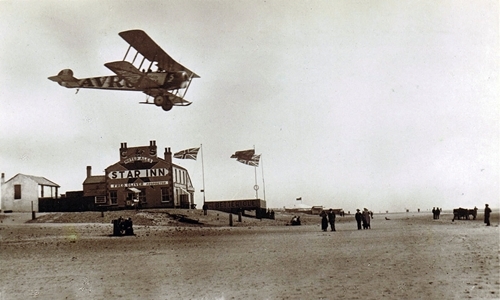 An AVRO Aircraft flying over the Star Inn, South Shore, Blackpool, 1919. THE daily return air service between Blackpool, Southport and Manchester, carried out during the summer by Messrs. A. V. Roe and Co., Ltd., has now come to an end. Of the 222 flights scheduled, 194 were carried out, the other 28 being prevented by" weather conditions. The number of miles flown was 8,730. The service was started on May 24, three and a half weeks after civil flying was legalised in Great Britain. It was the first daily service by air to be instituted in this country and to be mentioned in railway guides. It was in every way a pioneer undertaking, for when it was commenced the general public still had the impression that flying was a dangerous undertaking only indulged in by extremely venturesome spirits. Outside the R.A.F. there were no records of a daily air service to guide the Avro company in organising such an undertaking. Yet the service ran for 18½ weeks with no interruption except through bad weather on 14 days. We are informed that there were no mishaps of any sort, not even a simple forced landing. Before long the pilots grew so familiar with the route that they could find their way through weather which would have baffled a stranger. Punctually at noon each day at least one Avro left the sands at South Shore, Blackpool, and headed for Southport, which was reached at 12.15 p.m. At 12.45 the machine would descend at Alexandra Park, Manchester. The return flight started from this aerodrome at 2 p.m. The fare was five guineas for a single, nine for a return ticket. By degrees the service became popular, and before long it was paying its way. No passengers ever suggested that good value had not been received for his or her money— and the shrewd people of Lancashire are authorities on what constitutes good value. On the contrary, one and all were delighted, andmany expressed the opinion that aerial transport had come to stay, as being the quickest and most enjoyable method of getting from town to town.